Angela Lansbury in the 1971 movie "Bedknobs and Broomsticks"
A new stage musical adaptation of the beloved Disney film Bedknobs and Broomsticks is slated to debut at Chicago Shakespeare Theater next spring. Featuring Richard M. Sherman and Robert B. Sherman's music from the film along with new tunes by Neil Bartram, the tuner will feature a book by Brian Hill. Bartram and Hill penned the Broadway musical The Story of My Life. Bedknobs and Broomsticks follows three children evacuated from the London Blitz who arrive on the doorstep of Miss Eglantine Price, a patriotic witch-in-training and inexperienced broom flyer. The world premiere production, running May 30-July 28, 2019, will be directed and choreographed by Rachel Rockwell. 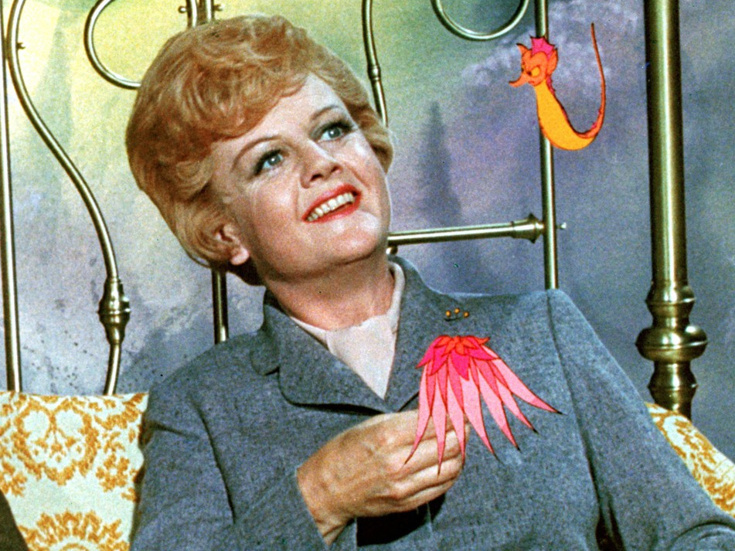 The movie Bedknobs and Broomsticks famously starred Angela Lansbury as Miss Price. Gear up for the stage musical with an original trailer for Bedknobs and Broomsticks below. Broadway's recent Charlie and the Chocolate Factory musical will bring a dose of pure imagination to audiences in Australia next year. The celebrated tuner based on Roald Dahl's children's novel, featuring a book by David Greig and a score by Tony winners Marc Shaiman and Scott Wittman, will play Sydney’s Capitol Theatre in January 2019, with exact dates to be announced. Tony winner Jack O'Brien will repeat his work as the musical's director. Look back at footage from the cheered Broadway production below. A slew of Broadway stars have signed on to test out the new musical Dangerous in a pair of readings next month. Tony nominee Denis Jones will direct the readings, slated to take place at Second Stage's Tony Kiser Theatre on April 5 at 11:00am and 3:00pm. In advance of the readings, music from the show will be featured in a sneak-peek concert at the National Arts Club on March 19 at 8:00pm. With a book and music by John C. Introcaso and lyrics by Michael Colby and Introcaso, Dangerous tells the story of a gangster who travels from 1930s Shubert Alley to Cairo and back. Leading the reading will be Olivier winner Lesli Margherita and current The Band's Visit star George Abud. Also slated to participate are Brandon Andrus, Michael Brian Dunn, Benjamin Eakeley, Scott Richard Foster, Trisha Jeffrey, Eddie Korbich, Storm Lineberger, Michael McCormick, Martin Milnes, N'Kenge, Emily Padgett, James Rana, Sarah Jane Shanks, Ryan Silverman, Madison Stratton and Price Waldman. P.S. Put on your pirate hat and listen to Christian Borle sing from Disney Junior's new animated series Vampirina.